Blessed José Luis Sánchez del Río. 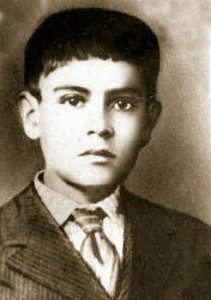 Blessed José Luis Sánchez del Río was just 14 years old when he laid down his life for the Catholic Faith in the persecution-ravaged Mexico of the late 1920’s. “Long Live Christ the King!” were his last words. 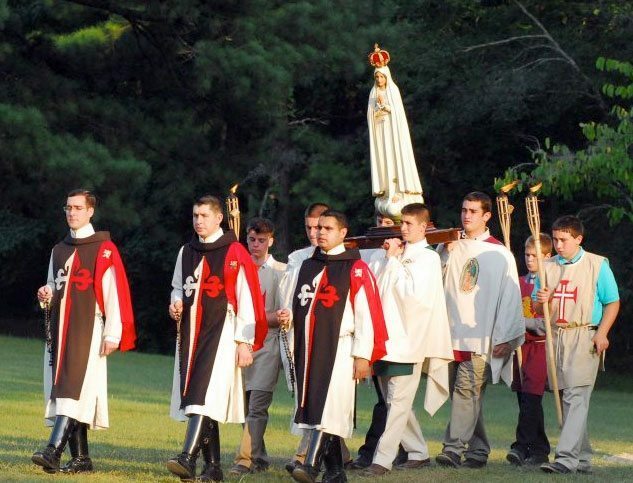 Over eighty years later, that battle cry sounded frequently among the teenagers at the Call to Chivalry Summer Camp for boys in Norwood, Louisiana, from June 30 to July 9, 2009. Forty-two Catholic young men from across the United States gathered to learn about the little-known Cristero Martyrs of Mexico and to participate in the adventure that is the TFP Call to Chivalry Summer Camp. Every TFP summer camp is an intellectual adventure with talks and presentations spread throughout the ten-day program. Msgr. Robert Berggreen, pastor of St. Agnes Church in Baton Rouge, gave the boys a talk on Catholic Apologetics, refuting the concept of Sola Scriptura (Scripture Only) and explained how the Church as the Guardian of Divine Revelation put together the books of the Bible. 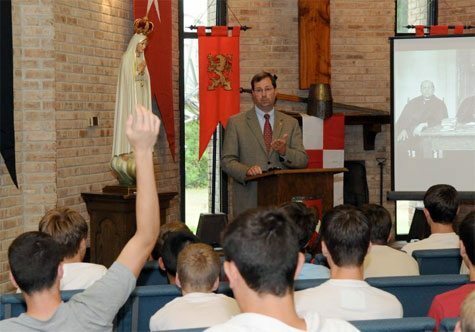 Setting the tone of the camp, TFP-Louisiana President Thomas Drake gave a talk on the Code of Chivalry, Knighthood and the Military Religious Orders. He gave each participant a copy of the Ten Commandments of Chivalry and challenged the boys to memorize them. TFP member and St. Louis de Montfort Academy instructor John Drake delivered a talk about the Medieval Social Order and about the Three Revolutions—the Protestant Pseudo-Reformation, The French Revolution and the Communist Revolution. Mr. Drake then gave a two-part talk about the Cristero War in Mexico (1926-1929). Illustrating his talk with a slideshow of historic photographs, he dealt with the anti-Catholic government persecution led by such cruel dictators as Benito Juarez and Plutarco Calles. Then followed a presentation on the uprising of the loyal Catholic Mexicans, the Cristeros, among whom were men like Anacleto Flores and Luis Padilla Gómez both beatified martyrs. In addition to Mr. John Drake’s talks, TFP volunteers gave talks about the Kingship of Christ, the Reconquest of Spain, Hernan Cortes and the Aztecs, the Story of Our Lady of Guadeloupe and a talk about the saintly President of Ecuador, Garcia Moreno. Mr. John Drake delivering a talk about the anti-Catholic persecution in Mexico in the 1920’s. In the cultural sphere, Mr. Gregory Escaro gave a presentation on the Power of Music. Complete with live piano, organ and trumpet samples, along with excerpts of Rock n’ Roll and Soft Rock, Mr. Escaro demonstrated how music is a strong spiritual and psychological tool which can lead one towards virtue or vice. Mindful of the boys’ formation as Catholic gentlemen, Mr. Bruno Schroeder gave a talk on Table Manners and on Gadgets and the Spiritual Life. Then Messrs. Peter Miller and Thomas Schneider of TFP Student Action gave a lively presentation on their adventures during TFP street and university campus campaigns in defense of traditional marriage in late 2008 in California. July 6 was designated “Cristero Day” and was celebrated with a Mexican-themed dinner made with the help of an America Needs Fatima donor in New Orleans who owns a Mexican restaurant. One of the boys’ mothers made a delicious Mexican cake which was presented to Msgr. Robert Berggreen for his birthday. 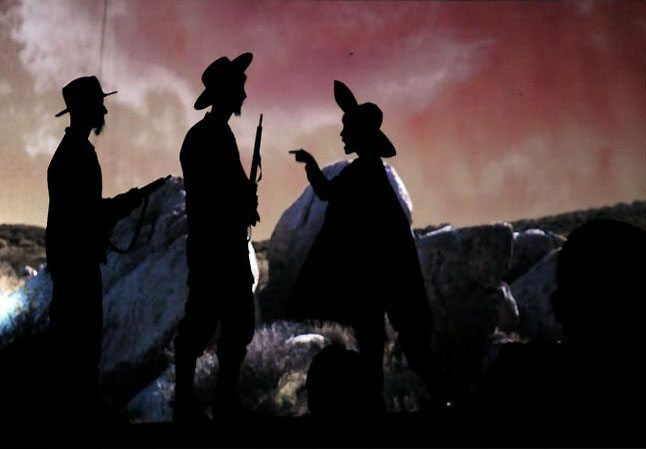 Each of the talks were enlivened with slideshows and some even had video clips, but what surely captured boys’ imaginations was a theatre skit about a Cristero named Pedro arrested for having a Rosary and a picture of Our Lady of Guadeloupe in his sombrero. Perhaps the most inspiring story, however, was conveyed in a “Chinese shadow” presentation on the life of young Blessed José Luis Sánchez del Río. The “Chinese shadow,” a combination of prerecorded narration and dialogue together with live silhouettes against changing backgrounds, was acted out by camp participants themselves. His story so inspired the boys that, for the rest of the camp, Blessed José and the Cristeros’ battle cry “Viva Cristo Rey!” became the boys’ constant rallying cry. In the line of adventures requiring athletic prowess, participants went on a hike through Tunica Hills, competed in outdoor field games and cooled off while swimming and jumping off a twenty-foot inflated “iceberg” in the middle of a lake. The boys also engaged in rock-climbing, zip lining, archery and a self-defense class given by Mr. Allen Taylor, who runs a self-defense school in Baton Rouge. In a test of wits and endurance, the boys divided into two teams and went on a treasure hunt. Thirteen clues were hidden throughout the 220-acre Feliciana Retreat Center containing riddles and even a Morse coded message to lead the teams on towards the treasure, a large box laden with chocolate coins and candy. Magnanimous gentlemen as they were, the victors shared the booty with the defeated team. To celebrate the Fourth of July, several of the boys’ dads cooked up a delicious barbecue complete with tender beef brisket, two kinds of sausages, potato salad and baked beans. The dads generously do this every year at the Louisiana camp and the boys and camp counselors always eagerly look forward to it. Earlier in the camp, the boys learned how to march in step together. 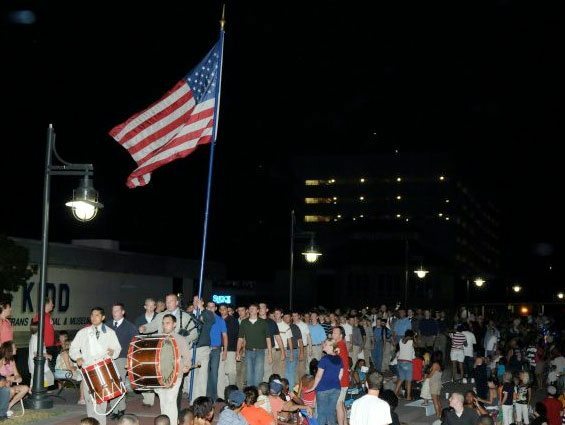 To the beat of drums and the sound of the “Marines’ Hymn” and “God Bless America” on bagpipes, the camp participants marched through the crowd gathered on the bank of the Mississippi River in Baton Rouge led by a large American flag hoisted on a sixteen-foot pole. Many in the crowd cheered the boys on as they looked up and saw them marching in cadence onto the destroyer USS Kidd to watch the fireworks display. Marching to the USS Kidd. As with all TFP Call to Chivalry summer camps, the grand finale is the Medieval Games and Banquet. Again the participants divided into two teams, each with its own lion or cross-emblazoned scapulars, battle cry and patron saint. They played each other in a series of games such as shield-ball, French football, steal-the-bacon and tug-o-war in a large field marked off with banners and pennants. A “canoe-run” obstacle course tested the teamwork abilities of the young men. Each four-man team carried a canoe over land and rowed it to the middle of the lake where they deploy the most nimble teammate to climb the inflated “iceberg.” At the top, the boy invokes his team’s patron saint and takes the twenty-foot plunge where he is picked up by his awaiting team canoe, whereupon they make their way to the finish line back on land. Needless to say, all this activity built up a ferocious appetite. While the Rosary procession meandered solemnly towards the banquet pavilion decorated with colorful flags and TFP standards, the evening sun sent its amber rays down on the boys and their parents. Escorted by three TFP members dressed in their ceremonial habit, a statue of Our Lady of Fatima is enthroned behind the main table. After Msgr. Berggreen blessed the food, bagpipes sounded the entrance of the cauchon du lait (suckling pig Cajun style) borne on the shoulders of four stronger boys. The castle cake dessert was also piped in and awed all with both its presentation and scrumptiousness. This entry was posted in Events of 2009 and tagged Academy, apologetics, Baton Rouge, Call to Chivalry, Catholic, Church, Cristero, Divine, hero, Louis de Montfort, Louisiana, Martyrs, Mexican, Plinio Correa de Oliviera, revelation, revolution, Saint, Summer Camp by Michael Gorre. Bookmark the permalink.